This was a surprise in my mail earlier yesterday - I've been trying to get a hold of this book, The Alchemy of Stone, for a little while now, and had some problems. 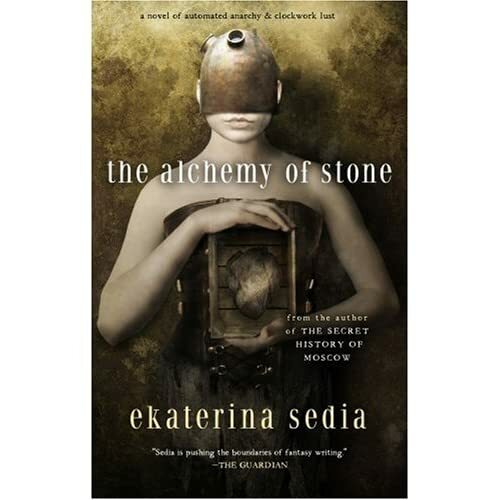 This third book by Ekaterina Sedia was one that I was really looking forwards to reading, and it was a fun book to read - While I waited for my computer to restart, I finished the last 150 pages in about an hour. The story follows Mattie, an intelligent automation in a world that is very steampunkish. Mattie is an alchemist, trying to discover a way to prevent the gargoyles in the city from turning to stone and dying out. They seem to predate the human inhabitants of the city, and are responsible for its construction and character. At the point in the story, the city is overcrowded, and divided. There’s a political rivalry between the Alchemists and machinists, which spills over into violence with the Duke of the city and his family is attacked and killed, culminating in civil war between classes. Mattie is at the center of this, as an Alchemist, but her creator, whom she is bound to, is a fairly cruel machinist who will not let her stray too far from needing him. This was a fun read, but not as good as I'd hoped it would be. It felt like a quick look into a vastly complex and interesting world and I didn't get the depth that I would have liked, and that easily could have been there. That being said, what I got was still a very good, engaging read. Where the story is somewhat lacking, it is made up for with the character of Mattie and the various struggles that she comes across in the story. Where most people would think of a robotic being as fairly robust and durable – watching any sort of movie about robots will tell you this – Mattie is weak, timid, and fragile, both physically and mentally. At several points, she is easily broken after being attacked, and must be rewound by her creator in order to function. She is shy, and eager to please her master, Loharri, while at the same time despising him and yearning to be completely free from his grasp, which is not possible, as he literally owns the key to her heart. There are many themes which run through this book that all intersect with Mattie, but the dominant one can be considered one of transitions. The city is changing, physically as there is a boom in construction and the machinists are taking over, building new things daily, which precipitate in a sort of political change. Between the Machinists and the Alchemists, there is a duel nature to Mattie as well, who was built by a machinist, but rejected that way in life, instead focusing on life. While the exact roles of the machinists and alchemists in this society aren’t entirely clear, they do bring up another duality, one of life and death, or fulfillment vs. automation, role vs. job and emotions vs. logic. There is a class system, we see, as angry coal workers, forced off their fields by robots, are tasked with mining coal, while the machinists are content to blindly follow another sentient automation, the calculator. This, to me, is an interesting theme, as it relates to themes that went on during the Renaissance period, a period of much change, but without the magic and fantasy elements. To some extent, the book has several issues that are still highly relevant today, if not more so. To what extent is a culture vibrant and full of life when it overwhelmingly utilizes machines and devices? At one point, a character that Mattie befriends, Naobi, an outsider, notes that the people of this city aren’t happy or content, they just exist. When reading that, I had to wonder how much of that was a sort of social commentary on today’s society, where the television, computers, mobile phones, MP3 players are the dominant forms of entertainment and recreation, rather than something that might be more fulfilling. It’s certainly something that I have thought about often. Another dominant theme that the book approaches is the city’s response to the death of their Duke, where foreigners were rounded up, harassed and at times, had their souls removed or were threatened as such if they weren’t cooperative. This was a somewhat chilling, if very unsubtle point in the book that is extremely relevant in today’s society after 9-11. Thankfully, this isn’t an overwhelming point in the novel. While it doesn’t detract from the reading, I always get nervous when any artist, whether it be a writer, singer or painter, uses their material as a soapbox, for it dates and lessens the material that they are releasing. The final big theme of the book is that of life and death. This is prevalent everywhere, from the machinists who create life from nothing, to the alchemists who preserve life, to the soul seeker who seeks to prevent it, while the gargoyles are slowly dying out. It seems fitting that Mattie, an automation, relates to all of those fields, while not alive herself, is a conscious being, actively seeking to preserve the gargoyles who still remain. More ironic, she is unable to remain alive without her human maker, who holds her fate based on his whims. This isn’t really a positive book when it comes to tone – it’s dark, gritty and at times, downright depressing, which came as a real surprise to me, especially at the end, when things came together. I can’t really remember a book that has done this, one that really puts the characters into place. Mattie is the true center of the novel, and is a brilliantly conceived character from the start, one who is curious, afraid, at times strong, and one who changes over the course of the story. While she is built, automated, I never once thought of her as a robot, but as an organic being – at times, I was trying to imagine her as a robot, and had a hard time doing so, which is absolutely fantastic, given what type of character she is – this is something that few authors that I’ve come across have been able to do, turn a machine into a character that you can really and truly care for, one where you don’t have to stretch your imagination to imagine her being hurt or having feelings. At the end of the book, I was happy to have gotten into a book and finished it in a day. The Alchemy of Stone was a fun read, engaging and interesting. I’d highly recommend it.